"You were a dear friend. I will miss you." "You were a dear friend." "Mr. Kelly was a wonderful man and I had the pleasure of waiting on them for a few years. they were such friendly and funny, he always..."
"I remember coming into the pharmacy when he was there. He was always so kind to my sister and I. He touched many. " "My condolences to the family. Know that Everett touched many lives. Hw was a great mentor for many bbq to follow. He was my dad's best..."
"RIP Everett. You will be missed. " "Mr. Kelly taught me a lot when he spoke at my school 25 years ago. My prayers go out to his family and friends. " Everett A. Kelly, 92, of Lady Lake, FL passed away on Tuesday, November 13, 2018. He was born in Foley, AL moving to Florida with his family at age three. Everett was a World War II veteran, having served in the United States Navy as a hospital Corpsman. After serving in the military, Everett returned to Florida where he graduated from public school in 1947. He then received his BS Degree in Zoology from Florida State University in 1951 and a BS Degree in Pharmacy from the University of Florida in Gainesville in 1960. Everett was elected to the Executive Committee of the Florida Pharmacy Association and served for two years on the statewide Drug Utilization Review committee. He was a former member of both the Florida Pharmacy Association and the American Pharmacy Association. Everett served in the Florida House of Representatives for 22 years. During his tenure he served on the committees of Appropriations, Agriculture, Retirement, Personnel and Collective Bargaining, the Advisory Council on Intergovernmental relations, The Advisory Council on Environmental Education, Finance and Taxation, Health Care, Insurance, Rules and Calendar and The Florida Boating Advisory Committee. He chaired the Committees on Health and Rehabilitative Services, Governmental Operations, Corrections, Probation and Parole, Regulated Industries Professional Regulations, Regulatory Reform, Natural Resources and the sub-committee on Aging, in the Health and Rehabilitative Services committee and the Vice Chair of the Committee on Health Care Standards. He also served as the Chair of the Senior Caucus of the Florida House. Mr. Kelly served as Speaker Pro Tem of the Florida House for two years in 1990-1991. He was a prime sponsor of the Lake Apopka Restoration Council Bill, The Environmental Ricco Act; The Lake Panasofskee Restoration Council Law; One of two house members who introduced legislation to set minimum daily nutrient loads for Lake Apopka, that led to the buy out of the Apopka Muck Farms; began the St. John’s River Annual Cleanup; he obtained monies to create Lake Apopka Flow Way. He was actively involved in the cleanup and restoration of the Harris Chain of Lakes since the late 1960’s and obtained the first ten million dollars to restore Lake Panasofskee in Sumter County. In 1978, Mr. Kelly received the R.Q. Richards Award for outstanding public relations in the field of pharmacy. In 1978 he was named “Pharmacist of the year” for the State of Florida. In 1989 he received the “Distinguished Service Award” from the Southeastern College of “Osteopathic Medicine” in Miami. In 1988, he received the “Hubert Humphrey Award” for outstanding public service in the field of legislative endeavors in the United States. He is the recipient of the 1990 D.I. Rainey Chiropractic Award, the Florida Department of Law Enforcement Crime Fighters Award, and the Legislator of the Year from the Florida Physical Therapists. He was the 1998 recipient of the “Bowl of Hygia” Award, and received the Coastal Conservation Association of Florida Legislative Award. Mr. Kelly was a practicing Pharmacist since 1960 in the fields of Retail, Hospital and Department of Correction Pharmacy. He was a member of the Masons, the Kiwanis, the Bahia Shrine Temple 234 in Tavares, FL, the Ambassador at Large for 1997, the Lake County Shrine Club, the Lake County Grotto, the High Twelve Club, the Former Eustis American Legion, a former member of The Heart of Florida Girl Scouts Council, the Central Florida Council of Boy Scouts of America advisory council, the co-chairman of the Correctional Education Association and the Elks Club. Everett served as chairman of the Lake County Centennial Committee. He served as the President of the Ibeni Tera Corporation, a not-for-profit corporation dedicated to cleaning up Florida’s surface waters. He also served as chairman of Drug Free Inc. in Lake County. Everett enjoyed fishing and writing. He was the former host of the outdoor television show called “Stumpknockers N’ Things” and wrote a column of the same title for the Daily Commercial, then a member of the New York Times Newspaper Group. He is a former member of the Florida Outdoor Writer’s Association. Everett was instrumental in getting permitting necessary to build the golf cart bridge over highway 441 in the Villages, FL. It is named The Everett Kelly Causeway. The Convocation Center at Lake Sumter Community College was created in his honor and named Everett Kelly Convocation Center. 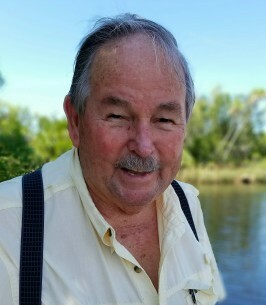 He is a published author of four books: The Atlatl (The Calusa Indians encounter with Florida’s discoverer Ponce de Leon), Ida’s Caleb (a historical novel of Central Florida in the 1870’s), a children’s book “Tiny Tom” (a factual account of the life of a baby turkey from an egg to becoming the Boss Tom of the woods) and “A Memoir From Nothing to Fulfillment” (his life story). Mr. Kelly was the CEO of the Thomas Langley Medical Center in Summerfield, a position he held since May, 2004. On August 21, 1982 Everett married Tara. He is survived by his loving wife of 38 years: Tara Kelly, Lady Lake, FL; son: Steve Kelly, Crawfordville, FL; daughter: Connie Collins, Grand Island, FL; step-daughter: Connie (Douglas) Hecht, Ocala, FL; brothers: Russell (Juanita) Kelly, Pensacola, FL, Larry (Phyllis) Kelly, Pensacola, FL, and Michael (Joyce) Kelly, Pensacola, FL; 9 grandchildren; and 6 great grandchildren. The funeral service will be held at 10:30 a.m. on Tuesday, November 20, 2018 at the Life Community Church in Eustis, FL with Reverend John Schneck and Reverend David Woerner officiating. The family will receive friends from 5:00 p.m. until 7:00 p.m. on Monday, November 19, 2018 at the church. The interment will be held at Florida National Cemetery in Bushnell following the services. In lieu of flowers donations may be made to Hospice of Lake and Sumter County at 2445 Lane Park Road, Tavares, FL 32778 or to Hospice of Marion County at 17395 SE 109th Terrace Road, Summerfield, FL 34491. Online condolences may be made at www.beyersfuneralhome.com. Arrangements entrusted to Beyers Funeral Home and Crematory, Umatilla, FL. To send flowers to the family of Everett A. Kelly, please visit our Heartfelt Sympathies Store. Please accept my sincere condolences to Everett Kelly's family during this difficult time. May many loving memories help over the coming days, weeks and months. I was honored to get to know the Representative while I was Director of the Lake County Library System. Everett was a Representative who always supported libraries. I remember him attending many events over the years during Library Legislative Days and standing up for library funding at the State level. I will always remember his kindness and his sense of humor, evidenced by the ever present twinkle in his eyes. The world has lost a wonderful presence with the loss of Everett Kelly. He could make you laugh and make you cry when he began trying to bring you on board with his projects to better the world or help some individual who was part of his constituency. I got calls many times for help with a statute he was contemplating or a person who needed legal advice. I always tried to live up to his expectations. I admired him greatly, both as a man and as a good political representative in Tallahassee. My deepest condolences to those who were closest to him. In memory of Everett A. Kelly. Thank you for being such a great friend to the Sumter County Chamber of Commerce and our entire community. I am so sorry to hear about Speaker Kelly's passing. He was a wonderful person with a unique sense of humor that served him well in the Florida Legislature. Things can be intense in that process and he had a way of bringing discussions back to the main point and adding a little humor at the appropriate moment. As a staffer in the House during his time there I can tell you that he was greatly respected. I personally enjoyed talking with him about the history of Florida. I aways came away from those discussions with a smile on my face. He will be missed. Thank you to his family for sharing him with the rest of us. You are in our thoughts and prayers. Uncle Everett, we grieve that you’re gone, but we’ll hug you in heaven. I love you. You were a dear friend. I will miss you. You were a dear friend. Mr. Kelly was a wonderful man and I had the pleasure of waiting on them for a few years. they were such friendly and funny, he always had me laughing. when I went on vacation he told me he was sending the policeman to bring me back. I will always remember. blessed be in heaven. I will miss you. I remember coming into the pharmacy when he was there. He was always so kind to my sister and I. He touched many. Everett was an uncommon politician. Down to earth, caring, unpretentious and just an all-around great man. I'm honored to have known him, Tara, Steve and Connie and to see how much he loved his Family. It hurts a lot to know he has left us but we also know he rests in the arms of Almighty God. Everett had a sense of humor second to none and I will always remember our times together-especially at Boulware's drug store in Tavares. My sincere sympathy to Tara, Steve, Connie and Everett's Family.